Reform Dashboard allows users and administrators and support personnel to view the statuses of documents processed through the Reform environment. Users will be able to view their own email, fax, and scan statuses from the Dashboard website. They will also be able to review details about their document, as well as the MFP that the document was scanned from. Two levels of support can be configured in the website. 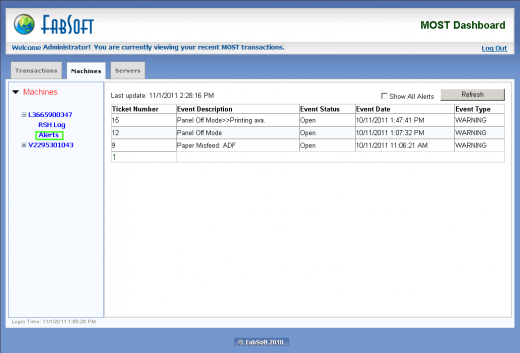 Level 1 will be able to view the processed documents for all users along with alerts and MFP’s MOST logs. 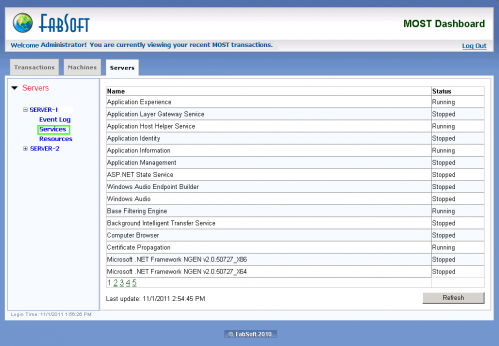 Level 2 will be able to view processed documents for all users along with alerts and MFP’s MOST logs, and all MFP issues, and server Event Log and services information. For Evaluation and Demonstration: Windows 7, 8, Server 2008, 2012 & 2016 (64bit only). Virtual servers are fully supported. 1. Make sure both Reform and MOST are installed and working correctly with your Ricoh MFPs. 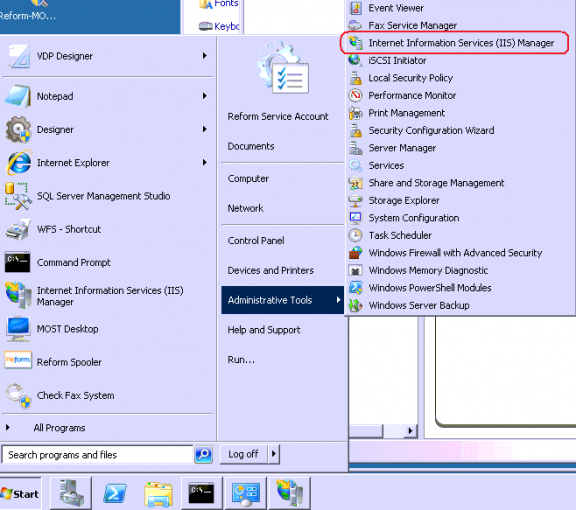 You should be able to login from the MFPs successfully, if not, please refer to the MOST installation and setup guide. 2. 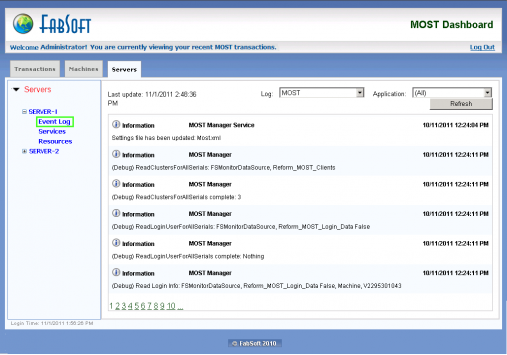 The MOST Server and MOST Dashboard should run as a domain account. 3. LDAP is required to be enabled in the MOST Manager. This setting is located in the MOST Manager by going to Edit >> Settings and navigating to the Authentication tab. A Domain must be specified if using the Active Directory server type. Please consult the MOST Manual for more information about the Authentication tab. 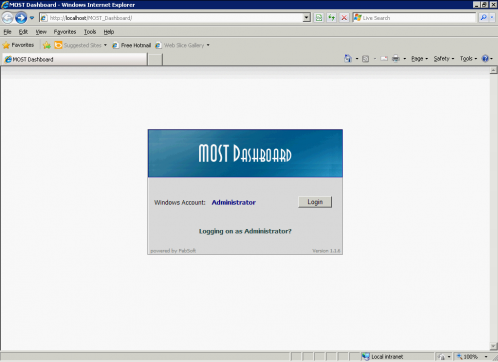 Users should be able to login to the MOST on the MFP using their Active Directory/LDAP user name. Step through the prompts until the setup begins. Allow the Most Dashboard installation to complete. 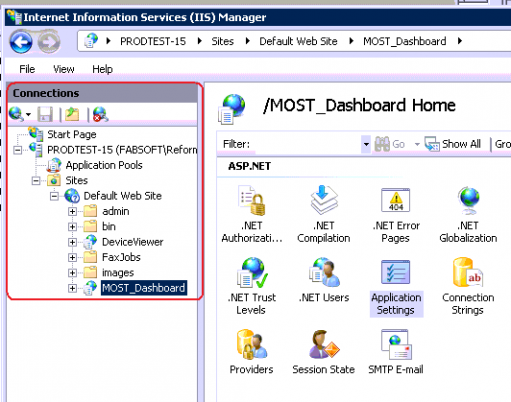 It’s required that you use IIS Manager to configure MOST_Dashboard Application Settings. In the Application Settings window, populate the required fields. DSN_Name Required DSN name of the ODBC connection for the SQL Server. 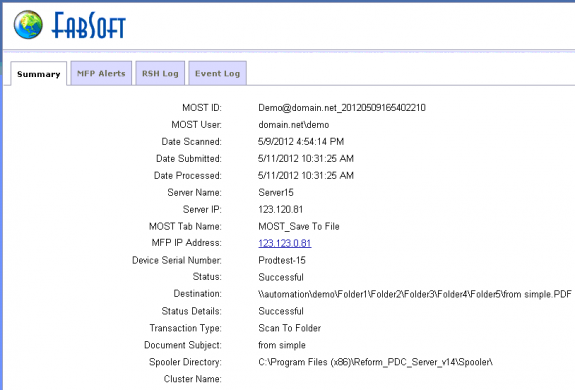 DSN_UserName Optional Username for MOST Dashboard to authenticate to the SQL Server. 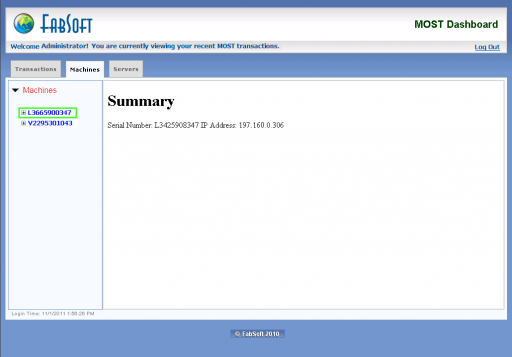 DSN_Password Optional Password for MOST Dashboard to authenticate to the SQL Server. DSN_TrustedConnection Required flag for the SQL connection. Can be set to "True" or "False. LDAP_Domain Optional domain name. If blank, and Dashboard is installed on the same server as MOST, the MOST LDAP settings will be used. LDAP_Group_ITLevel1 Optional LDAP security group name for Level 1 support users. LDAP_Group_ITLevel2 Optional LDAP security group name for Level 2 support users. 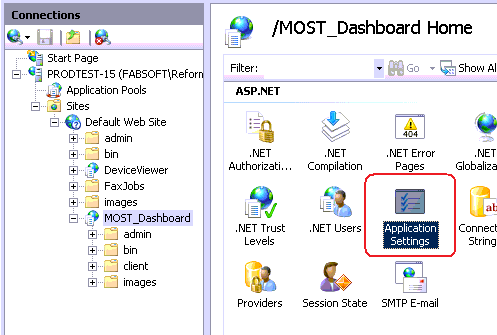 To open the MOST Dashboard Website, go to Start > Programs > Reform… > MOST Dashboard > MOST Dashboard Website. The website will open, it looks like the one below. Click in the Login button. 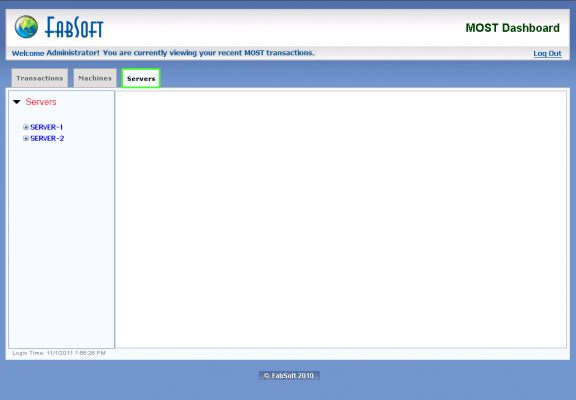 You will be directed automatically to the Transactions tab in the webpage. Note: The account you log into the website as should be a domain user. 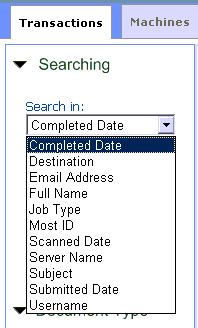 In the Left Panel you can search by Completed Date, Destination, Email, Full Name, Job Type, Most ID, Scanned Date, Server Name, Subject, Submitted Date, and Username. After selecting the Field you want to search, click the Search button to display the transactions. The results can be filtered by Document Types. 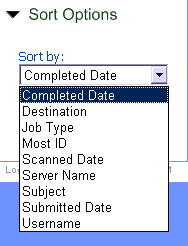 It can also be sorted Completed Date, Destination, Email, Full Name, Job Type, Most ID, Scanned Date, Server Name, Subject, Submitted Date, and Username. 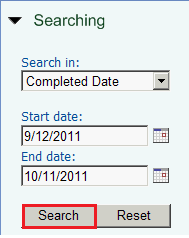 Every document on the transaction list will have the date it was scanned, submitted and when it was completed. 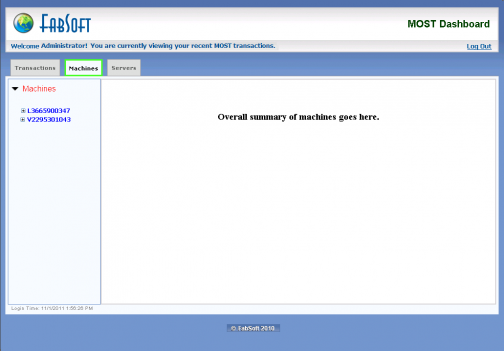 To see the Transaction Detail, double click the desired transaction. Now please click the Machines tab. You will see the list of machines in the left side. Note: To access the Machines tab, you must be part of the Level 1 or Level 2 support groups. Click in any of the Machines in the left side of the screen. It will show the Serial Number and IP Address of the Machine. When you expand the list for the machine, you will see the RSH Log and the Alerts for the specified machine. 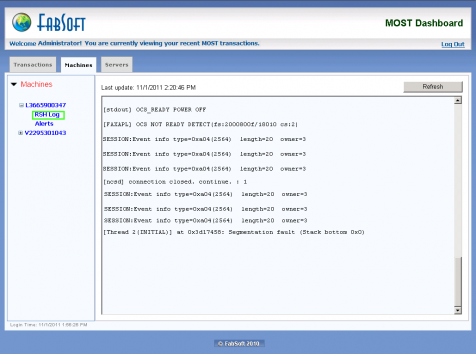 Click the RSH Log, the logs from the machine will appear in the window. Click the Alerts link and you will see the alerts from the machine in the window. Now please click the Servers tab. You will see the list of Servers we have been working from. Note: To access the Servers tab, you must be part of the Level 2 support group. 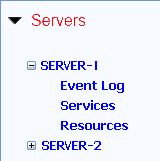 When you expand the list for the Server, you will see the EventLog, Services and the Resources for the specified Server. Click the Event Log link. It will show the Event Log from the server on the window. Click the Services link and you will see the list of services and the Status. There are certain directories that need to be monitored for growth along with the MOST Dashboard Plug-in for MOST. As a system processes more and more jobs, the size of these directories can grow very quickly. Overall system performance can be affected by the large amounts of space that the files may take up. Also, there exists a 10GB database limit if using the Microsoft SQL Server Express supplied with this installation. Obsolete files/database entries should be deleted according to your needs and file retention specifications. This page was last edited on 16 October 2017, at 12:51.